According to the Pew Research Center,68 percent of Americans use Facebook. Furthermore, Facebook is one of the most popular websites in the world. Most people who use Facebook spend about 58 minutes on it each day. But coming up with a Facebook marketing strategy isn’t as easy as setting up a Facebook business page and hoping people will like it. You have to be proactive in managing your Facebook page and using features like boosted posts and Facebook Ads. 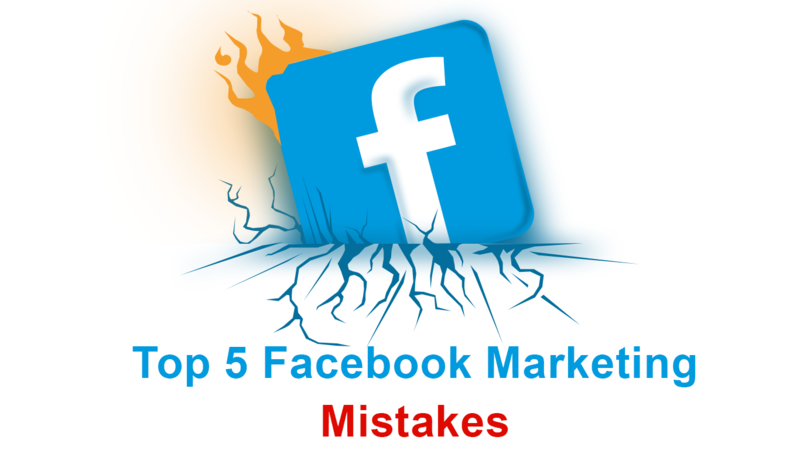 Learn how to avoid the top 5 Facebook marketing mistakes small businesses make, so that you can stay ahead of your competition. You probably have a goal in using Facebook for small business. Primarily, you want to promote your products and services. When using Facebook, you have to think like the user. Facebook users don’t use Facebook to buy things. 82% of people don’t make direct purchases via social media. And although most people know they can buy things via Facebook, they just don’t trust the platform enough to do so. If every one of your posts is an ad for your business, you’ll turn people off. Use Facebook to show off your company and its culture. Who works behind the scenes? What can you tell people to give them information about your industry? How can you engage with your customers to keep your business in mind when they have a need? According to Hootsuite, there are over 80 million small and medium business pages on Facebook. To stand out, you not only have to post regularly, but you should engage with your customers. Respond to any comment, positive or negative. Let other customers know that your customer service is exemplary. People who take the time to ask questions deserve to know that their input is important. Use their most frequently asked questions to provide new content to your audience. Furthermore, Facebook continues to make changes to its algorithms that make it harder for businesses and other pages to show up in user news feeds in favor of posts from friends and family. By posting consistently and engaging with your customers via comments, your posts will appear in more news feeds. Small businesses are finding it harder to get organic reach on Facebook because of changes Facebook made to their algorithms. You may have to pay for Facebook boosted posts to get more engagement. However, Facebook ad targeting tools make it easier to reach your potential customers by letting you pinpoint demographics to create custom audiences or target people based on other factors. Pay to boost your top content and run ads that have a high ROI potential. Don’t forget to analyze ads after the campaign is over to know what worked and what didn’t. Spend money with goals. Treat your business page seriously. For the most Facebook engagement, be relevant to your customer. Ad value to the users who follow your page. Don’t just post funny memes of animals or people. ➤ Be consistent across your social media pages. ➤ Use your business logo. ➤ Use the same colors as your logo and website. ➤ It’s ok to use humor, but keep it business related. The idea is to make people remember your business when they need to solve a problem. If you’re using Facebook as part of your digital marketing strategy, you need to focus on the long-term. Don’t just post for one or two months and give up. You’ll have a better organic Facebook reach when you think about the long haul. Invest time in getting Facebook up and running before trying to branch out to other platforms. Being on every platform, every day is overwhelming. What do you think about using Facebook to market your small business? We want to hear from you. Tell us about your triumphs and struggles in the comments below. And don’t forget to subscribe so you can get more marketing tips and strategies delivered right to your inbox.